Inspired by the 1987 true story, “McFarland, USA” follows novice runners from McFarland, an economically challenged town in California, as they give their all to build a cross-country team under the direction of Coach Jim White (Kevin Costner), a newcomer to their predominantly Latino high school, with whom they ultimately bond to build not only a championship cross-country team but an enduring legacy as well. Disney’s McFarland, USA stars Kevin Costner, Maria Bello, Morgan Saylor, Martha Higareda, Michael Aguero, Sergio Avelar, Hector Duran, Rafael Martinez, Johnny Ortiz, Carlos Pratts, Ramiro Rodriguez, Danny Mora, Valente Rodriguez, Vanessa Martinez and Chris Ellis and is directed by Niki Caro with screenplay by Christopher Cleveland & Bettina Gilois and Grant Thompson, and story by Cleveland & Gilois. 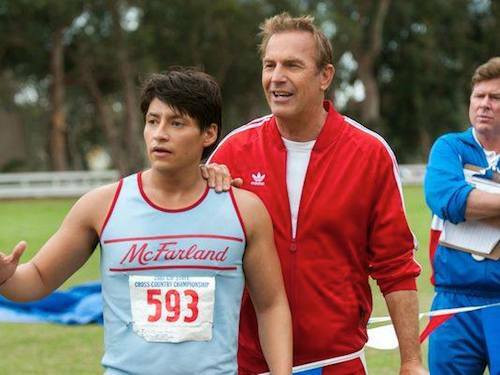 McFarland, USA opens on February 20, 2015!